Bogota, Feb. 19, 2013 [AlterPresse] --- Jerry slip-sides deftly under the night sky lighting up the broken walls of Haiti´s capital. His rapid-fire hands spray paint this buzzing Caribbean city with images of love and hope side-by-side with pictures of prostitution and political destruction. Jerry Rosembert Moise, a humble yet immensely driven 30-year-old who grew up in the ghettos of Port-au-Prince, plys his trade as a graffiti artist covering the walls of downtown Port-au-Prince and the suburbs of Petionville and Delmas. After the massive earthquake that rocked Haiti on 12 January three years ago, Jerry – who the US-based writer Pooja Bhatia has called the Graffiti Prophet of Bois Verna - began working more and more in the provincial areas of Miragoane and Leogane to “re-build my country through artistic inspiration”. 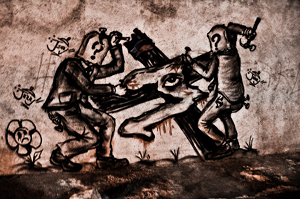 From Aristide to Martelly, he’s never voted as many of his street murals depict a deep sense of dismay with political life and he feels an increasing need to try to export his work to the nearby galleries of Santo Domingo and the lucrative Miami markets. “Here in Haiti there´s just not enough jobs, desperation is everywhere and it´s simply hard to get money,” he explains. “About a year after the earthquake I broke into painting water colors on canvas and pitched a few paintings at an exhibition in Paco, Port au Prince”. “But even though I sold over 100 copies I could only scrape together anything from $50 to $100 USD a piece”. “It´s true that since the earthquake, we’ve seen a new trend of street artists emerging,” Myriam Nader, the Owner/President of Nader Haitian Art, told AlterPresse. Nader lives in New Jersey in the US and has worked for many years exporting Haitian art around the region for the family-owned Nader Art Gallery. “We’ve continued to push sales in the US and the Caribbean,” she stresses. “We lost thousands of irreplaceable objects of art including masterpieces by great artists like Hector Hypolite and Castra Basile,” she says. “Our art is uniquely joyful and vibrant,” she continues. “However, the past decade has been sadly marked by a lack of art promotion and in more recent years tourism in Haiti has plummeted”. “If we export our paintings to the US or the Caribbean we could fetch up to $150,000 USD, which is very reasonable,” says Nader. “Haitian art is now about diversity, mixing the modern and abstract with traditional works full of color and life”. “We have the best art in the Caribbean at a reasonable price”. While Jerry´s graffiti also abounds in color and life, his work is sometimes humorous and often cartoonish. But it always has a deeper meaning. “As we move into 2013 there are still thousands stuck in the tents and those who leave still have no work and need money,” says Jerry. “Quick and easy robberies and killings are part of a new trend of “motorcycle violence”, which is on the rise as new gangs rebuild in the slums of Martissant and Cite de Soleil”. “These troubles have inspired much of my latest drawings,” says Jerry. He talks of a gigantic mural he recently painted depicting a “Haiti girl” suffering in need of rest yearning for a beautiful former era and now lost in an upside-down-world where everything is slipping away”. While Jerry’s paintings have changed over the last decade, his fight for social justice continues. But this fight is a difficult one for all Haitians including the artists and Jerry believes that Haiti has to find new ways to reconnect with its Caribbean neighbors. In July last year, Jerry travelled with twenty graffiti artists from Guyana to Puerto Rico, including the famous graffiti artist Ske, to the neighboring island of Guadeloupe to take part in a graffiti competition and hip-hop festival. “It was great to be able to connect with other artists from the Caribbean,” he says. “Haitian artists need more exposure now more than ever to bring our beautiful country back to life together with our island friends”. Nader agrees with this need to connect with foreign markets saying, “While we still export to countries like Barbados and Martinique in the Caribbean and the US, our sales are moving toward the European countries where they are more valued for their quality and affordable prices”. Following the earthquake and after many years out of the exhibition game, Galerie Nader participated in the first exhibit of Haitian art at the Louvre exhibition in Paris. 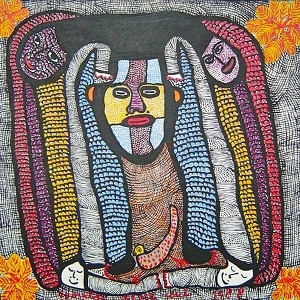 Later in April 2011, naderhaitianart.com was involved in another exhibit – Art for Education - with more than 200 attendees at the Rockefeller Center in New York City. The Consortium for Haitian Empowerment and the Lisa Left-Eye Lopes Foundation organized the exhibition, giving ten percent of the sale proceeds to scholarships for underprivileged youth from Haiti and Honduras. “Over the last year or two in particular, we’ve been able to raise awareness about Haitian art and culture to promote our beautiful and world-class art across the region”. “Primitive board works by Jean Leonidas, impressionist canvas pieces by Louizor Ernst and more traditional vibrant works by Pierre Louis Prosper are opening new doors both here in the US and across the Atlantic,” details Nader. Nader explains that they have more exhibitions coming up in New York including a show with a variety of Haitian artists at the Rockland Community College in New York during the entire month of April 2013 for the Haitian Heritage Month.